For the chronically lazy who lack the moral fibre to climb Binevenagh from its foot (in my defence it had been a couple of days of minimal sleep and maximal sore throat) it can be climbed in a more perfunctory fashion by turning off the road across the mountain's NE slopes at (705 314 C) then driving up to the car park by the shore of Binevenagh Lake (691 307 D). From here bear round the NW end of the lake (the right as you look) on obvious trods. 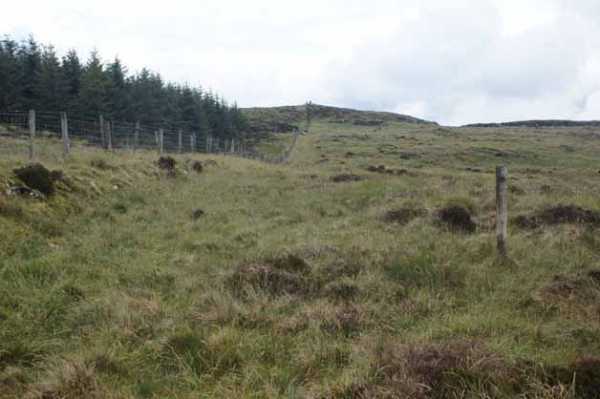 Keep to the right of a conspicuous hummock, and maintain roughly the same direction (with a very slight descent) to reach a fence, which can be followed up to the skyline and summit with its pillar; this route should keep you on paths all the way (shortcuts cost more energy).